The Bicycle Coalition Youth Cycling (BCYC) Program is part of the Bicycle Coalition of Greater Philadelphia’s education department. The program works with youth ages 12-18 across Philadelphia in building healthy habits, leadership, and independence through the sport of cycling. BCYC builds entry level to advanced competitive cycling skills with its teams through the progressive program tiers, but it does not stop there. BCYC embraces pillars of positive youth development through sport to inspire and nurture the growth of the whole athlete – emotional wellbeing, academic success, civic participation, career planning, and beyond. The leadership ladder is key to this holistic youth development – beginning by entering a core team at one of our 8 partner sites, youth graduate through a series of programs and achieve increasing levels of accomplishment and responsibility – the highest of which is the Youth Advisory Committee (YAC). The YAC is a group of 4 youth leaders who drive the direction of the program and participate in local and national organizing towards their vision of safe streets and equitable access to the sport they love: cycling. You may read more about our programs, including how to join the team, here. The Program was founded in 2007 as “Cadence Cycling Foundation” out of Jay’s Cadence Cycling & Multisport Center, in Manayunk, as a means to introduce more youth to the sport of cycling. The program began as a partnership model with a number of high schools, many of whom are still active partner sites to this day include champion school Shoemaker Mastery Charter. The founders of Cadence brought a strong legacy of professional cycling and racing and standards for academic and personal success that built a solid foundation for the programs growth. In 2013, Cadence Cycling Foundation merged with the Bicycle Coalition of Greater Philadelphia (BCGP) and became one our Education Programs. Since the merger, BCGP renamed the program Bicycle Coalition Youth Cycling, grown the number of program participants, and expanded the program’s disciplines to include off road and advanced leadership programming. 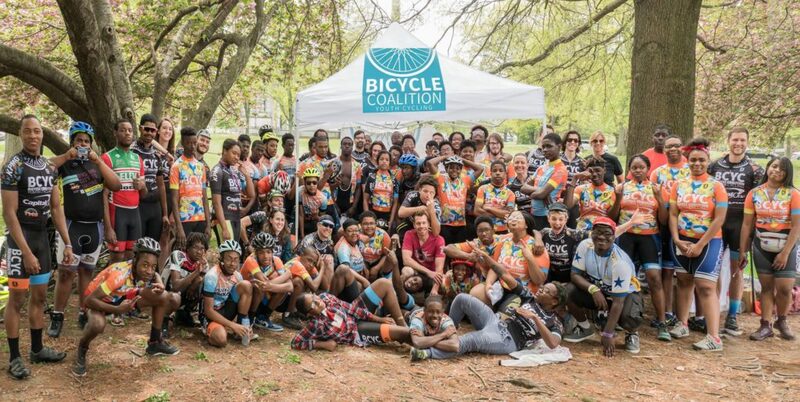 To learn more about Bicycle Coalition Youth Cycling’s impact on the program’s youth throughout the years, check out our annual wrap up reports below. Thank You Bicycle Club of Philadelphia!